VanRug Cargo Liner for 1992 - 2015 Ford E series (Econoline) 138" wheelbase standard length cargo vans. Only for standard length models. With its ¾" custom molded foam backing the VanRug gives you the look and comfort of carpet, in an ultra-tough 100% polypropylene (essentially plastic) product. That means not only will it protect your van, it will provide impact and cargo protection and act as a heat and noise insulator. VanRug uses closed-cell foam which is non-abrasive and will not scratch the finish of your van and installation is done without drilling holes. Put simply, VanRug can be used for years and when removed, your van looks like it did the day you bought it. 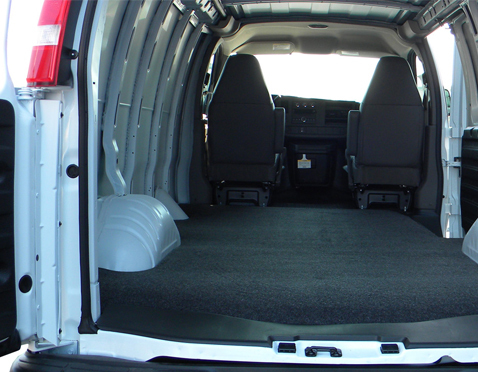 Provides 3/4" of impact absorbing closed cell foam to prevent your van floor from dents and dings (and provides a cushioned surface for your knees!). 3/4" of custom molded foam padding completely flattens out the factory rib configuration. This provides a loading surface that is simply unmatched by any other liner. The true test is when you first kneel on the product! VanRug is soft enough to sleep on yet tough enough to take on even the nastiest of jobs. VanRug 3/4" foam floor and plastic fiber surface is the best anti-slip material on the market. VanRug grips and absorbs your cargo to hold it place during transport. Backed by a manufacture's lifetime warranty. Usually ships by the next business day. Fedex Ground Only. Please allow an additional 1-5 business days for delivery to most US locations.